Is this the real web? While flying through space or shooting up zombies might sound like more fun ways to make use of VR, virtual reality tech can also transform the way that we experience the everyday stuff - like watching movies or browsing the web. 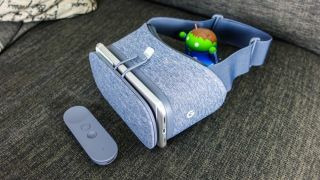 As per Google's François Beaufort, the first VR features are now available for you to try in Chrome 61: just load up any webpage in Chrome, slide your mobile into a Daydream View headset, and you're off and running exploring the internet in virtual reality. Google actually added support for the WebVR technology to Chrome back in February, but this new update lets you surf any site on the web in a VR environment, whether or not it has any specific virtual reality extras added. "So far this allows users to view and interact with any website in VR, follow links between pages, and move between 2D and immersive viewing for sites that support WebVR," says Beaufort, who also promises there are a lot more features on the way. If you're after some virtual reality websites to try this out with, you could head to these 360-degree videos uploaded by Ford, or this virtual tour of San Francisco - just make sure you've updated your mobile version of Chrome to version 61 before you get started. As we said though, you'll be able to browse any site through VR now. Chrome and Daydream aren't the only browsers and devices working on WebVR support either: Apple is already interested and Firefox has added the tech too, making it compatible with the Oculus Rift and HTC Vive headsets. We could have some more VR announcements in store at Google's October 4 event.